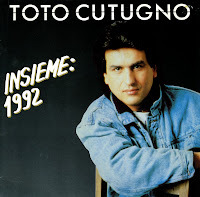 Toto Cutugno was born on July 7, 1943 in Fosdinovo, Tuscany, Italy as Salvatore Cutugno. In 1976 Cutugno participated for the first time in the San Remo Music Festival. He reached 3rd place with his band Albatros. He won the festival in 1980, 1984, 1987, 1988 and 1989. In total he participated 13 times. He won the Eurovision Song Contest in 1990 with his own composition 'Insieme: 1992' ("Together: 1992"), a ballad which celebrated European political integration. Along with Gigliola Cinquetti, Italy's only other Eurovision winner from 1964, he presented the 1991 contest, which was staged in Rome as a result of his victory.